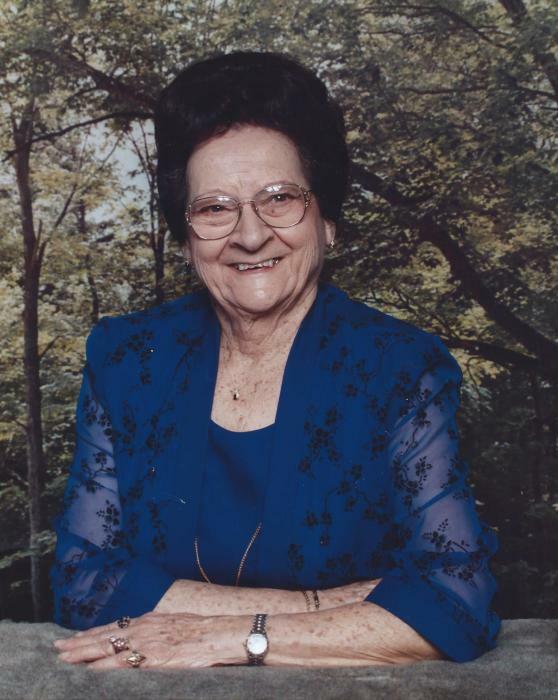 Lucille “Frenchie” Gillenwater, 94, of Arcola, IL passed away at 8:02 A.M. on Friday, August 31, 2018 at Carriage Crossing in Arcola, IL. Funeral services will be held at 11:00 A.M. on Monday, September 3, 2018 at the Edwards Funeral Home, 221 East Main St., Arcola, IL. Pastor Steven Stern will officiate. Burial will follow in the Arcola Cemetery. Visitation will be held two hours prior to the funeral from 9:00 A.M. to 11:00 A.M. on Monday, September 3, 2018 at the funeral home. Frenchie was born on March 1, 1924 in Golden Meadow, LA and was the daughter of Aramis Martin and Angelina Angelette. She met her husband, Elvin Gillenwater, while she was employed at Fort Polk in Leesville, LA. They were married there on September 16, 1944. Upon Elvin’s discharge from the Army in 1945, they settled in Illinois around Charleston and eventually in Arcola where they farmed and raised a family. There they lived out the remainder of their lives. Elvin passed away on June 19, 1986. She was preceded in death by her parents; her husband; two sisters, Lucia St. Pierre and Bertha Williams, both of Louisiana; four brothers, Uderick, Lindberg, and Clarence Martin, all of Louisiana, and Stanley Martin of Alabama; and one grandson, Clint Gillenwater of Champaign, IL. She is survived by a daughter, Lynn Pace and her husband Tap of Troy, VA; a son, Andrew Gillenwater of Arcola, IL; two grandchildren, Ryan Bourgeois and his wife Kasey of Bremo Bluff, VA and Sasha Hunt and her husband Blake of Tuscola, IL; five great-grandchildren, Joseph Pace of Troy, VA, Nathaniel and Annabelle Bourgeois and Lily and Karly Miller all of Bremo Bluff, VA; and a brother, Lincoln Martin of Galliano, LA. Frenchie got her nickname because of her Cajun French accent. Both of her parents spoke and understood very few words of English. She only learned English when she attended school but always kept the easily recognizable accent throughout her life. Much of her time as a widow she spent volunteering for Catholic Charities in Mattoon, at the Arcola Food Pantry and delivering Meals on Wheels. Gardening vegetables and flowers were a source of joy for her along with travel that included every state and many different countries. She was a dedicated member of the First Baptist Church in Arcola where she was a custodian for many years. Line-dancing was a special interest and she performed on a regular basis with a line-dancing group from Mattoon until age 88. She loved being with people and kept her car and the road very busy and always used to joke that the epitaph she wanted on her headstone was “finally ran out of gas”. Frenchie was a wonderful cook and love having family around her kitchen table. Being able to spend time with her grandchildren and great-grandchildren was very special times for her. At age 90 she became a resident of Carriage Crossing Assisted Living Facility in Arcola. Memorials are suggested to the First Baptist Church of Arcola or the Arcola Food Pantry.